Succulents make up a broad category of plants with thick, fleshy stems and leaves. It’s a group of wonderful plants, many of which make great houseplants because they are survivors that adapt easily to typical household environments and are very easy to care for. Before we delve into the detail, here is a quick summary of indoor succulent care. How to care for succulents indoors: Provide as much light as possible for your indoor succulents and water thoroughly, but infrequently, only when the potting mix is dry. Plant your succulents in pots with plenty of drainage holes and in well draining potting mix such as 50% potting soil and perlite. Although botanists are not in total agreement about what makes a plant a succulent, a good basic definition is that it’s a plant that stores water in the stem or leaves. Succulents include the aloe, agave, haworthia, aizonaoceae (ice plants), crassulaceae (jade plants, echeverias, kalanchoes, sedums, and sempervivums), gasteria, sanseveria, and cactus families, with species of many other plant families exhibiting varying degrees of succulence, as well. The reason why a plant stores water is also important. The term “succulent” usually refers to xerophytic succulents – the drought-resistant plants that we are most familiar with – and not to halophytic succulents, which are plants that store water so they can survive in salty environments such as seashores, swamps, and marshes. No introduction to succulents would be complete without discussing the relationship between succulents and cacti. So here’s the deal: Cacti are a subgroup of succulents, which means that all cacti are succulents, but not all succulents are cacti. The term “succulents and cacti” is a bit confusing, as it implies that these are two different groups of plants.To add to the confusion, the word “cactus” appears in the common names of many succulents that aren’t actually cacti. Also, some succulents have thorns or spines that make them look like cacti, even though they aren’t. The way to know if a plant is a cactus is to look for the small bumps, called areoles, at the base of outgrowths such as hairs, spines, branches, leaves, and flowers. Only cacti have these features. Additionally, save for one species known as the mistletoe cactus, cacti occur naturally only in the Americas, ranging from the Arctic Circle to southern Chile, whereas the larger class of succulent plants are found across the globe. While succulents are generally associated with hot desert climates, you may be surprised to learn that many succulent plants are native to areas that get plenty of rain but have a dry season or have rains that come sporadically – including jungles and rainforests – or that they’re found in regions that are dry but not hot. With such a diversity of natural habitats, it shouldn’t be surprising to learn that the lighting and temperature preferences for succulents in nature vary greatly. Some succulents, particularly desert cacti, need eight hours of full sunlight, while other succulent varieties require shade or partial shade. Some like it hot. Meanwhile, there are succulents that prefer cooler nighttime temperatures or rely on cold winters for their yearly growth cycles. Fortunately, this variability means there are many succulents that thrive as indoor houseplants. 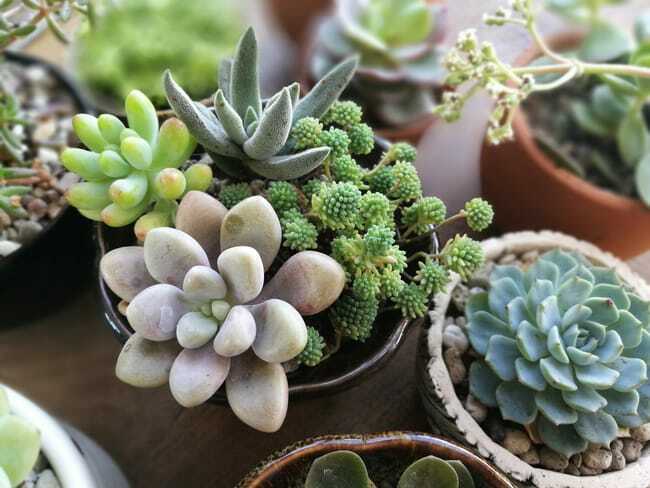 The most popular houseplant succulents are those that prefer less intense light, continually dry air, and consistent temperatures that are typical to indoor environments. Succulents that are naturally green are best for use as houseplants because they can photosynthesize more readily in indoor lighting conditions and their color will remain vivid, whereas succulents of other colors will suffer if they don’t get plenty of full sunlight. You’ll find a list of the most popular indoor succulents, organized according to lighting requirements, in the section on that topic below. Note that among the succulents listed, the Christmas cactus stands out as the exception to the general guidelines for humidity and watering. They are an unusual type of plant known as a jungle cactus that grows in the moist understory of tropical forests. For a comprehensive list of succulents, with pictures, have a look at this very helpful resource from plantsam.com. It’s also very handy if you already own succulents, but are struggling to identify them. Other than specific lighting needs and the exceptional Christmas cactus, care requirements for succulents growing indoors are pretty uniform. The good news is that succulents are less demanding than most types of common houseplants, since they are slow growers and tenacious survivors. Following a brief summary of succulent houseplant care, this article will provide you with an in-depth look at how to care for succulents indoors, from how to provide the best growing conditions to tips for planting to FAQ that will help you identify and correct problems you may come across with your succulent houseplants. You’ll find that growing succulents isn’t difficult, and in fact, it can be quite habit forming, once you realize the joy that these plants bring with their fascinating shapes, textures, and personalities! 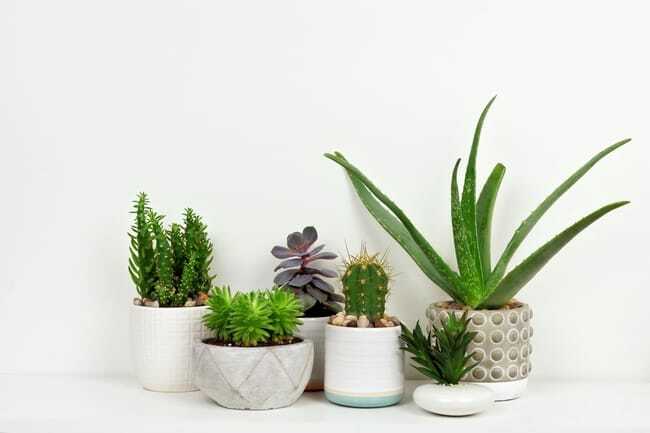 The succulent plants that make for the best houseplants are those that don’t like full sun and are not dependent on the parts of the light spectrum that are blocked by modern windows, which are designed to reduce solar heat radiation and protect interiors. Yet even with this limitation, lighting requirements for indoor succulents vary from indirect or filtered to bright light. Be aware that although certain succulents are often highlighted as plants that will tolerate low-light conditions, too little light inhibits growth, mutes colors, and causes stretching of the leaves and stem, which weakens plants and makes it more difficult for them to survive. Too much light, on the other hand, will burn many types of succulent plants, which is also quite harmful. If burning occurs, prune the damaged area off the plant and move it to a location with less intense light. To get the right balance of light for plants that prefer less intense lighting, set them near a window that doesn’t receive direct sunlight or that’s protected by sheer curtains, or place them further away from a sunny window, in a spot where they will get plenty of indirect sunlight. Place succulents that require more lighting in a window that gets a lot of bright sunlight throughout the day. The exception to this is if you’re in a location where afternoon summer sunlight is too intense, in which case you should opt for a window that provides morning sunlight, which is less harsh. Or consider providing 14-16 hours of fluorescent grow lighting per day to ensure these succulents are getting enough light for their needs. If you decide to move a plant from a lower light location to a spot with more light, don’t do it suddenly, as plants that aren’t accustomed to bright light can get sunburned just as people can. Rather, make the change gradually, increasing the time the plant is exposed to brighter light by 30 minutes every couple of days. In general, succulents prefer moderate temperatures. Of course,some succulents are frost tolerant, while many are of tropical origins and should not be allowed to go below about 50 F (10 C).The succulents that are commonly used as houseplants will do well at temperatures in the range of 50-80 F (10-27 C) that are typical of indoor environments. Some succulents will go into survival mode or dormancy when temperatures are outside their comfort zone. 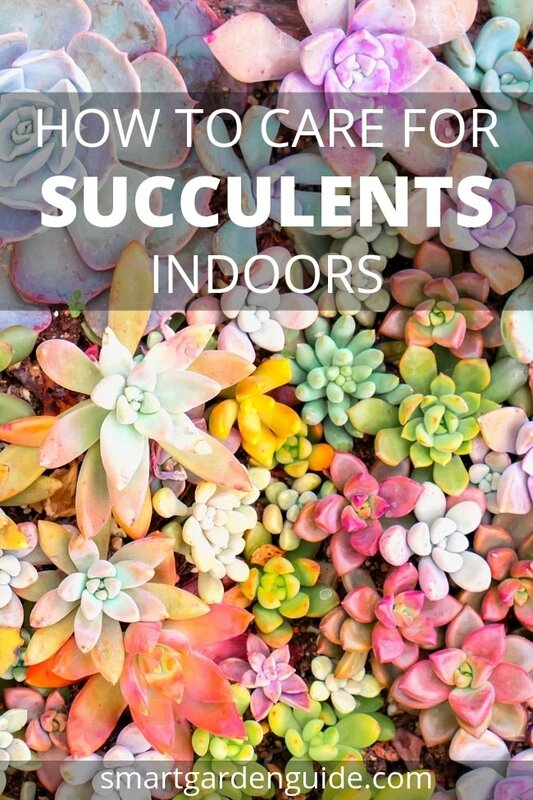 But the water stored in their plant cells makes succulents susceptible to damage from the effects of extreme temperatures – especially when such high or low temperatures are paired with high levels of humidity. Due to their high water content, humidity is not good for most succulents, even within their ideal temperature range. One of the main reasons that succulents do well in most household environments is that they are typically quite dry, with relative humidity levels of 10-30 percent. This is the perfect amount of humidity for most succulent plants, as it encourages both fast drying of the growing medium after watering as well as healthy water storage by the plant. If your indoor air circulation is lacking and your plant’s potting soil is allowed to remain too moist, you’ll end up with a situation that raises the local humidity around the plant, which will quickly lead to fungal infection and rotting. The one exception is the Christmas cactus, which prefers higher humidity as well as soil that’s kept evenly moist. Potting soil for succulents should be well draining and fast drying, to prevent problems caused by local humidity, over-saturation of plant cells, and root rot. Sandy soil that’s made up of equal parts organic and inorganic material is a great potting mixture for succulents.The idea is to provide a blend that will hold enough water for your plant to absorb what it needs when you water but will then dry out quickly. To ensure that there are plenty of air pockets within the soil so as to encourage drying and provide sufficient oxygenation of the roots, include materials such as pumice, crushed granite, bark, or coco coir chips that have larger particle sizes, of around a quarter inch, or 6 millimeters. Commercial succulent or cactus soil mixtures work pretty well, but they can be improved by blending in some pumice or other pebbly material. In addition to using a well-draining, fast-drying potting mixture, you may also want to place pebble mulch on top of the soil for a stylish accent to your succulent’s bold form and texture. With all this talk of the importance of soil that drains well, it may be redundant to add that you should use pots with drainage holes in them for succulent plants. This not only helps the soil dry out quickly but also enhances oxygenation of the roots.However, sometimes aesthetics outweigh everything else, and containers without drainage win out. If this is the case, then be sure to use a pebbly potting material to provide excellent aeration to the roots of you plant. Believe it or not, you can use pure pumice, which is porous, rich in micronutrients, and looks classy inside clear glass. Watering is a little tricky, though, as detailed in the next section. While most succulents are pretty tenacious in the face of less-than-perfect care in other respects, they will quickly become damaged from over-watering or soggy soil. Succulent plants are built to store water and depend on a cycle of water abundance followed by a period of dryness. So, how often should you water succulents? The answer is that it depends on a wide range of factors, including the potting mixture, the size of the pot, the type of plant, the size of the plant, the location, the time of year, and the weather. Desert cacti typically require less water than other types of succulents. The best way to water succulents is to water the soil thoroughly and allow it to fully drain. You should then allow the soil to dry out completely before watering again.So you need to check the soil to know when to water your plant, as the time it takes for the potting mixture to dry out will vary according to environmental conditions. In general, you’ll be watering more often during the heat of the summer, although you’ll find that your plant needs less frequent watering when there’s a lot of humidity, rain, or cloudy weather. To check the dryness of the potting mixture, insert a wooden stick or skewer through to the base of the pot, leave it for a few minutes, and then remove it and look for signs of dampness. Or, if you’re not afraid of a little dirt, simply poke a finger in and feel how damp or dry it is. Alternatively, you can familiarize yourself with how heavy the pot is when it’s completely dry by feel or with a scale, then use that as a reference to know when your plant is ready for another drink. While it’s more likely that you’re over-watering than under-watering succulent plants, you’ll know you aren’t providing enough water when you see wrinkling and shriveling or the upper leaves begin to appear crisp and dry. To water succulents growing in containers without drainage, the aim is to provide just enough water to wet all of the potting material without having water pool at the bottom. To achieve this, start by estimating how much potting mixture there is and measure half that amount of water. If it’s not a clear glass container that allows you to see if any water is pooling, monitor the potting mixture for dryness, keep a close eye on your plant for signs of over-watering, and make small adjustments to the amount of water you pour in until you get a good feel for what the right measurement is. Succulents are light feeders, so you should only fertilize them once every couple of months from March through September using houseplant food that contains more phosphorus than nitrogen. Dilute the fertilizer by one-quarter the recommended dosage for cacti and by half for other succulents. Succulents are very easy to propagate. If the plant produces small, bulb-like offsets, simply pinch them off, allow several days for a callus to form, and plant them in soil. To take stem cuttings,use a clean, sharp knife to cut the plant just above a node. For plants like sansevieria, cut leaf portions of about 2 inches (5 centimeters) in length. Allow the wounds to callus over then bury a small portion of the cuttings in soil, making sure they are right side up, as roots will only form from the bottom part. After planting, keep the soil moist for about four weeks, then use the normal watering method for succulents. Some succulents can also be propagated by carefully pulling leaves from the stem, making sure to get entire, intact leaves. After allowing them to callus over, set them on top of some succulent soil, and wait for roots to form before watering thoroughly. 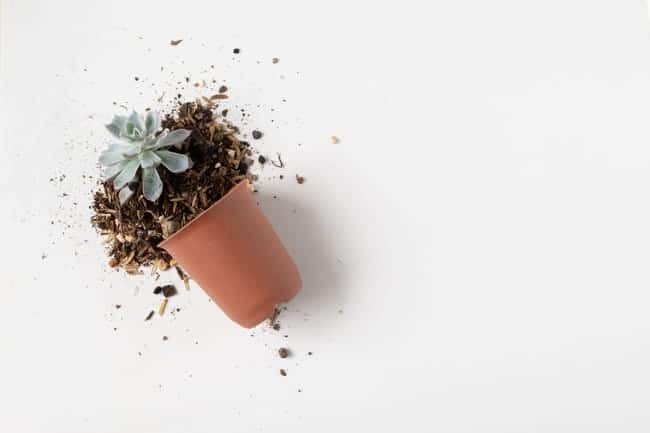 To pot a succulent for indoor growing, begin by choosing a container that’s about 2 inches (5 centimeters) wider than the diameter of the plant. Fill the container to about three-quarters full with your well-draining potting mixture and dig out a hole to place the plant in. Then gently spread out the roots of your succulent a bit, making sure to remove any old potting soil that may be clinging to them. When placing the plant in the new container, cover the roots with enough soil to reach the base of the plant, making sure to leave space below the bottom leaves. Refrain from watering the plant for a week to allow the roots to spread out, unless the plant is very young or you’re propagating new plants. If you’re creating a succulent container garden, be sure to choose plants that are compatible in terms of watering requirements and rate of growth. Most succulents prefer to be somewhat root bound, and some will flower more readily when this is the case. So you only need to repot healthy succulents into a container that’s an inch or two larger if they become top heavy and unbalanced. The other reason to repot a succulent is if the potting mixture has been allowed to remain soggy and the plant has become waterlogged, in which case you should carefully remove the damaged sections with clean gardening sheers, rinse the roots with water, and repot in fresh potting soil that has better drainage capacities. Repotting should be done in the springtime, when the growth period begins, and never during the winter dormant stage, when the plant is unable to recover quickly. 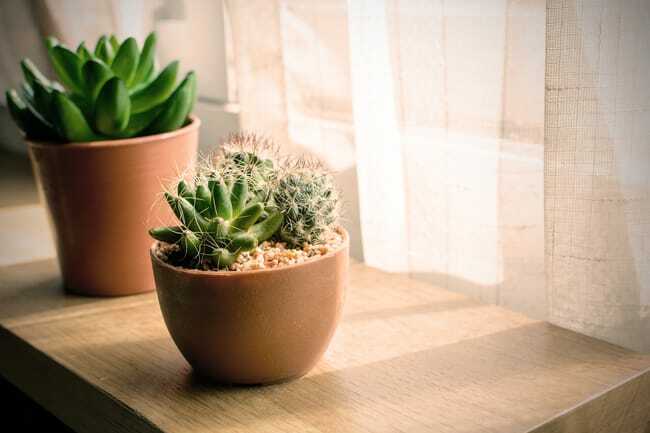 The main diseases to watch out for in succulents are fungal and bacterial rots caused by too much moisture, which can be prevented by proper succulent care. To save a succulent that has begun to rot, remove any blemished or rotted sections, making sure to cut back to where there is healthy tissue and consider repotting. Like many other houseplants, succulents are susceptible to infestations of scale, mealybugs, and spider mites. Isolate an infected plant immediately to prevent the infestation from spreading to other plants. If caught early, these sap-sucking pests can be wiped away with rubbing alcohol. Here is an article outlining the common pests and diseases, along with pictures. 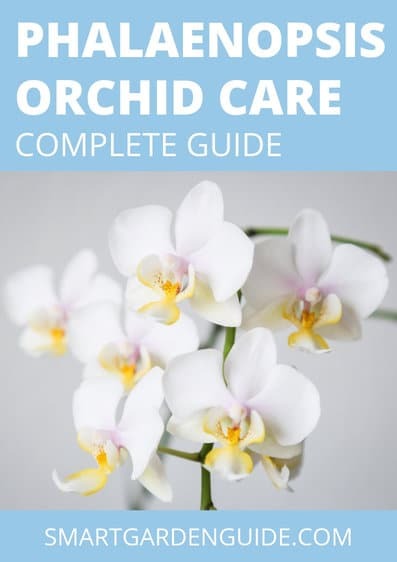 In this section, we’ll answer some of the most frequently asked questions about caring for succulents indoors to help you troubleshoot problems and learn about some important aspects of succulent plant care that haven’t been addressed in the sections above. Note that most of these are harmful only if ingested in large quantities. Nevertheless, it’s best to be informed, in case you would rather not expose your pets to even the slight possibility of harm. Why Is My Succulent Losing Leaves? Don’t worry about leaves at the bottom of a succulent plant that are wilting and dying off, as this is part of the natural process of shedding the old to make way for the new. Just gently pull them away, if you want to have your plant look tidier. It’s the leaves at the top of the plant that you need to keep an eye on. Leaves that fall off at the slightest touch are a sign of over-watering or soil that’s remaining moist when it should be allowed to dry out completely between watering. Why Are My Succulent’s Leaves Turning Yellow? Yellowing leaves are a sign of distress that could mean several things. If it occurs along with leaves or stems that are mushy and translucent, it means the plant tissues are suffering from too much water. Or, it may be a symptom of overheating or signal an infestation of pests. Why Are My Succulent’s Leaves Curling? A succulent’s leaves will curl back and downward when there isn’t enough light, in an attempt to expose a greater area of the leaves to capture more of the available light. Conversely, if the plant is getting too much light, the leaves will curl inward to protect themselves. Why Are My Succulent’s Leaves Turning Brown? Browning and rough texture are signs of tissue burn from lighting that’s too intense. How Do I Know If My Indoor Succulent Is Healthy? A healthy succulent will have vibrant coloring and stems or leaves that are plump, firm, and upright. Hopefully you’ve enjoyed this article on how to care for succulents indoors. I can’t recommend them enough as a house plant. They are so interesting, rewarding and diverse, and I believe that anyone can be successful in growing them at home. If you have any questions about caring for succulents indoors, please leave a comment below, or contact me using the contact form.